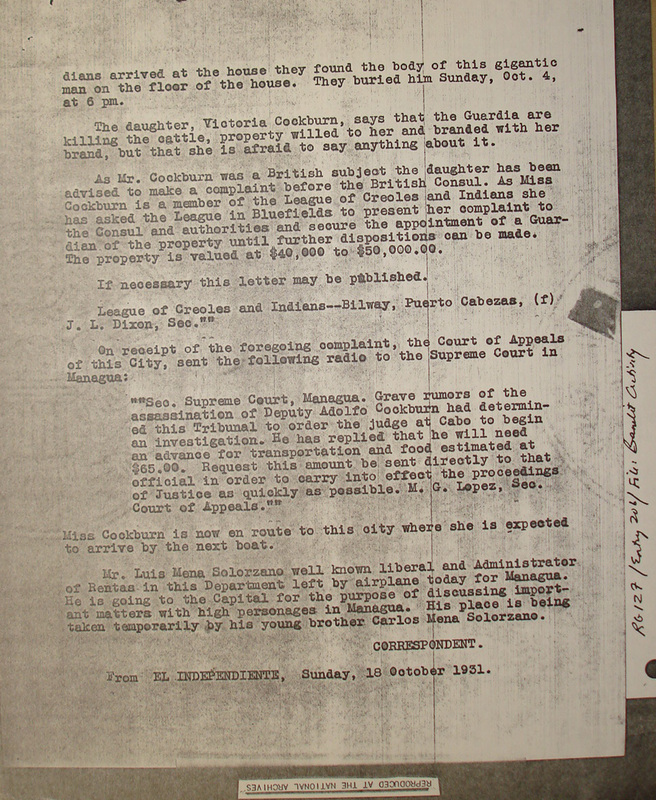 THIS IS THE THIRD PAGE of documents for the SECOND HALF of 1931 on Nicaragua's Caribbean Coast region, housing material dated in the 44 days from September 12 to October 25. 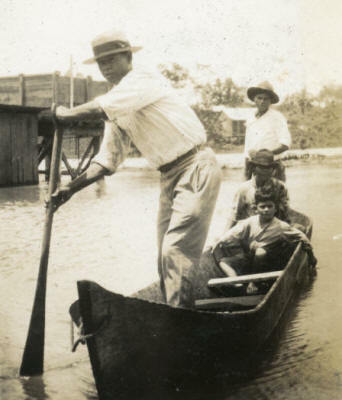 Offering a unique, insider’s look at Sandino’s rebellion on the western frontier of the Coast, this page includes seven never-before-published EDSN missives — five from Col. Abraham Rivera (Sept 17 & Oct 2, 8, 10 & 14) and two from Gen. Sandino (Oct 11 & 25) — that together show the rebels regrouping & recovering from the previous months’ offensives, even as Sandino plans for yet another. As we see in his Oct 11 letter to Gen. Simón Gonzalez, Col. Abraham Rivera & Tnte. Col. Perfecto Chavarría, the Supreme Chief envisions a 100-man expedition to the Atlantic Coast, to be launched from Wiwilí in late October. It is, as we see in the battle described in Lt. Surprenant’s combat report (Oct 24). 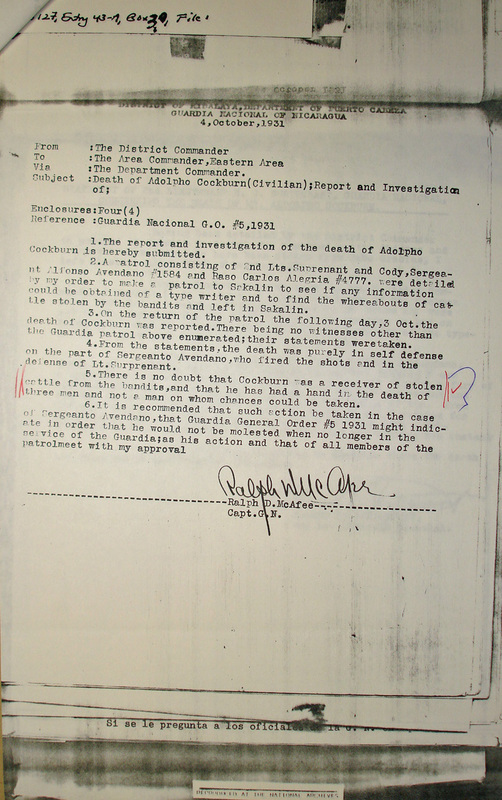 Another highlight here is the 6-page “Report & Investigation of the Death of Adolfo Cockburn” (4 Oct) — killed on Oct. 3 by the Guardia Nacional at his home in Sacklin under what appear to be highly suspicious circumstances. The scenario portrayed in the testimony of Lt. Suprenant, Sgt. Avendaño & others — that after being confronted with evidence about his typewriter having been used by the “bandits,” Cockburn "flew in a fury of rage ... and reached for a pistol which was on a table right aside of him" before being shot dead by Sgt. Avendaño in order to save the life of Lt. Suprenant — frankly stretches credulity. Whatever the precise manner of his death — and to me it reads as a clear-cut case of calculated political execution — the EDSN suffers a crushing blow & the Guardia eliminates a powerful enemy. Another account of Cockburn’s death appears in the Bluefields newspaper El Independiente (18 Oct). Erroneously attributed to J. S. Dixon, Secretary of the League of Creoles & Indians of Bilwi, and in key respects directly at odds with the most plausible elements of official version (especially the business with the typewriter & the bodily location of the fatal gunshot wound), the account is very probably entirely fabricated. 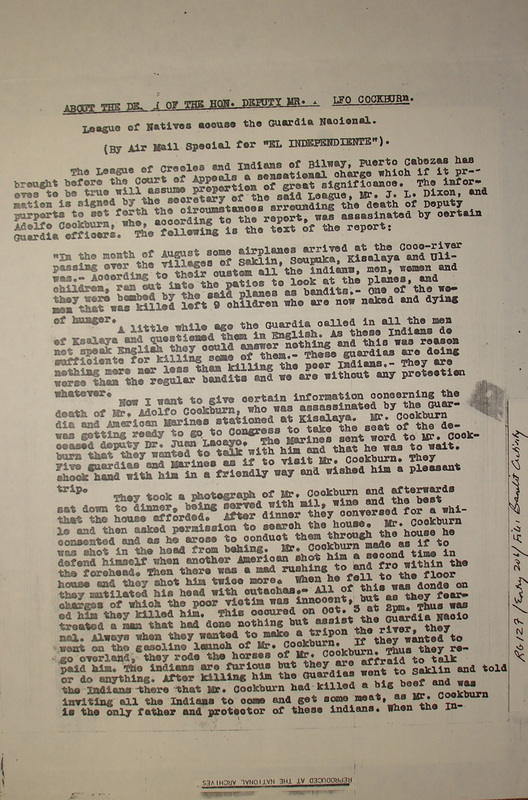 Remarkably, Sandino remains in the dark about Cockburn’s death for weeks afterward (25 Oct). 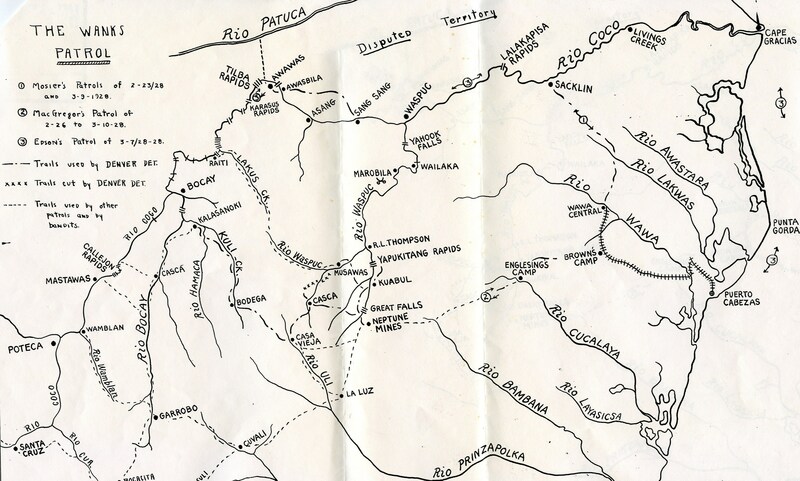 The Guardia’s garrisoning of Kisalaya in mid-September, upriver from Sacklin on the Río Coco, is another significant event of these weeks, described by the new Area Commander Col. Leech as “a most valuable military addition to the Area,” denying “bandit approach from the northwest” (9 Oct). Establishing another permanent Guardia garrison at the Neptune Mine, on Mr. Springer’s dime (1 Oct), and committing to establishing another at Wuani (16 Oct), the Guardia continues to extend its military power into the key strategic points of the interior zones. In sum, after a brief lull, and with the export economy in shambles, the adversaries in this intensifying fight are poised to lock horns on the Coast once again. Radiogram from US Consul Fernald, Puerto Cabezas, to Sec. State, Washington D.C. "A band of dozen bandits is reported to have raided two or three villages near at hand last week travelling from lower Cuculaya towards Waspuc Rivers. There are further vague rumors that a large sized offensive planned for before next January hereabouts. ..."
Radiogram from Marcorps to Commander, 2nd Brigade USMC, Managua. "0021 STATE DEPARTMENT HAS STATED THAT ESTABLISHMENT AVIATION OPERATING UNIT AT PUERTO CABEZAS IS CONSIDERED CONSISTENT WITH ANNOUNCED POLICY PROVIDED NO INCREASE IN PERSONNEL OF BRIGADE PERIOD UNDERSTAND THIS WILL REQUIRE INCREASE OF TWO OPTION LOVE PERIOD MATTHEWS STATED THAT HE CONSIDERS ESTABLISHMENT OF THIS BASE ADVISABLE AND NECESSARY BEFORE NAVAL SHIPS CAN BE RELIEVED PERIOD IF YOU DESIRE ESTABLISH THIS UNIT SUBMIT RECOMMENDATION 1410"
Radiogram from Comsperon to OPNAV (Chief of Naval Operations), p. 1. "0023 COMSPERON RECOMMENDS AGAINST THE ESTABLISHMENT OF AN AVIATION UNIT AT PUERTO CABEZAZS ...HISTORY OF AVIATION IN EASTERN NICARAGUA IN PREVIOUS YEARS DOES NOT REPEAT NOT JUSTIFY THIS REESTABLISHMENT IN HIS OPINION PERIOD THE COUNTRY BEING LOW AND HEAVILY WOODED INTERFERES VERY MATERIALLY WITH THE DISCOVERY OF PATROLS OR ABILITY OF PLANES TO COMMUNICATE WITH THEM IF FOUND COMMA DUE TO LACK OF OPEN SPACES FOR SIGNAL PURPOSES PARAGRAPH PLAN PROPOSED IN COMSECBRIG 0022 451 IS SOUND AND RECOMMEND FOR TRIAL FOR THE REASON THAT THE GUARDIA SHOULD HAVE ALL SUPPORT WHICH THEY REQUEST IF THIS CAN PROPERLY BE GIVEN PERIOD MINISTER HANNA NOW ENROUTE TO WASHINGTON AND COMPSPERON DISCUSSED THIS MATTER THOROUGHLY AT BALBOA ..."
Radiogram from Comsperon to OPNAV (Chief of Naval Operations), p. 2. 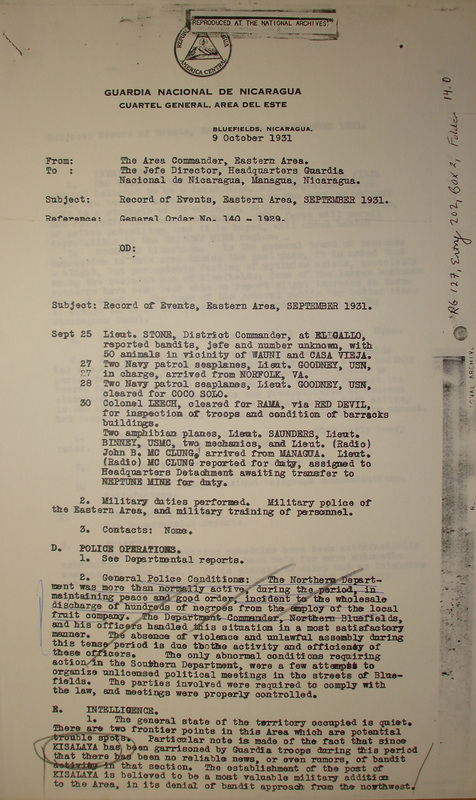 "... THIRTEEN SEPTEMBER PERIOD RECOMMEND ACTION BE DEFERRED PENDING HIS ARRIVAL IN WASHINGTON PERIOD COMSPERON NOTES THAT MATTERS OF IMPORTANCE HAVE AGAIN BEEN COMMUNICATED TO A PART OF HIS COMMAND WITHOUT REFERENCE TO HIMSELF PERIOD HE REQUESTS THAT NECESSARY STEPS BE TAKEN TO AVOID SIMILAR INSTANCES IN THE FUTURE 0950"
Military Information re Neptune Mine Region. Area Commander Col. L. L. Leech, Bluefields, to Jefe Director GN, Managua. "... On September 26, 1931, the District Commander of Rio Grande, at El Gallo, forwarded information to this office, which was transmitted to the Jefe Director in my dispatch #09326, quoted herewith:- UNCONFIRMED REPORTS INDICATE CONSIDERABLE ACTIVITY VICINITY WAUNI [STOP] RIVERS EXTREMELY HIGH [STOP] RECOMMEND RADIO OPERATOR AND EQUIPMENT BE SENT HERE SOON AS PRACTICABLE TO OPEN COMMUNICATION WAUNI NEPTUNE SECTION. ¶ 2. The following are quotations from two personal letters, one from Wauni, dated September 16, 1931, and the other from Prinzapolka, dated September 29, 1931, which have been received in Bluefields:- ¶ (Wauni letter) ¶ "- - Do not come as yet because there is danger in CASA VIEJA. The 'reddies' have camped there, and they only want to know if there is any merchandise in Wauni or Siuna, or if there are any guardias to come and attack. It is about six days ago that the sons of Railito came and told me about it. Do not come as yet because the 'reddies' may come here at any moment." 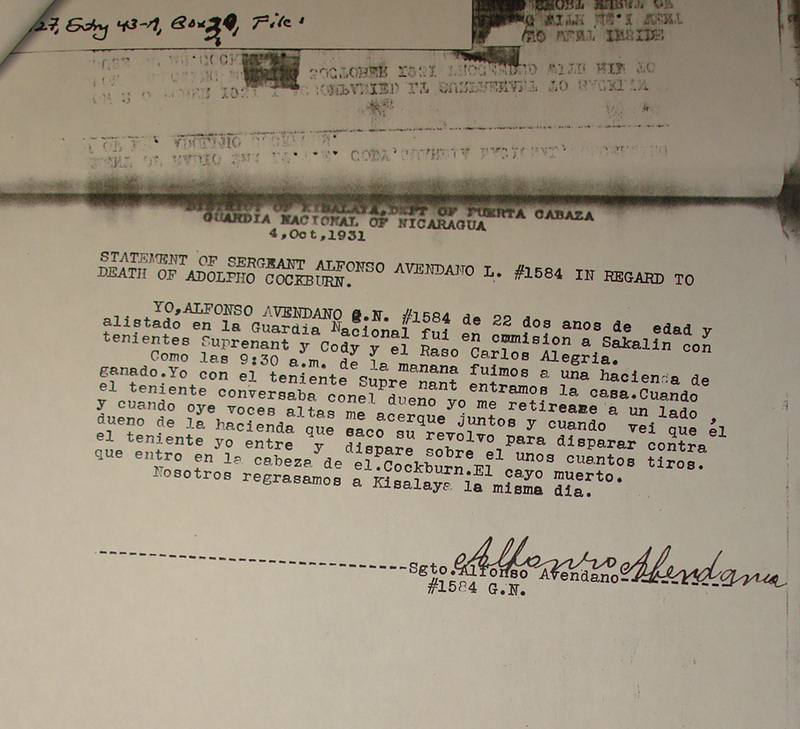 ¶ (Prinzapolka letter) ¶ "Julia, I notify you that Jesus Games [Jesús Gómez] passed here for Port with all his family and he told us that the 'reddies' were in ILLIAS, and that Selestino Romero had to take to the woods so as to come out to Cuiquinita." ¶ 3. Second Lieutenant Juan B. RODRIGUEZ, Bluefields, has been given preliminary orders to proceed, with ten (10) enlisted, to Neptune Mine, clearing this city on October 6, 1931. After effecting replacements of enlisted personnel at Neptune Mine, Lieutenant Rodriguez will have a strength of twenty (20) enlisted, and in view of the well organized and armed civico force there, active combat patrolling will be required, in the future, from Neptune Mine." Intelligence Extract from Weekly Report, Capt. R. McAfee, forwarded by Capt. O. A. Inman, Puerto Cabezas, to Area Commander Col. L. L. Leech, Bluefields. (n.d., covers last week of Sept. 1931). "The general state of the District is friendly. The Indians here and those who travel the river are friendly; they bring such products as they have for sale. They stop off here on all their trips up and down and are willing to talk as much as they know. ¶ From all information gathered there are no bandit activities any nearer than Bocay; and these were said to have cleared out on the approach of the airplanes. However the Indians are pretty much in a state of terror over the bandit situation. They have been molested very little in comparison to the inhabitants of the Central and Northern areas, but they seem more exciteable and have more fear. ¶ There are several Nicaraguans and half breed Indians who are bandits or at least in sympathy with the bandits who live around Waspuk and Sang-Sang. These names are known to me; having been given by reputable people. Fortunately these are mostly wanted for some crime and if captured can be disposed of easily. Having a good boat I intend to try and clear these people out or at least drive them out of the country. ¶ These people having had no protection have been a prey to the bandits and their propaganda, and it may take some time to eradicate the impression, but it is only a matter of contact; as they are ruled only by fear, and possibly by gifts of stolen cattle the bandits have been unable to carry off. ¶ Information as to the general headquarters of the bandits was related, It is near Cua about half a days march from Santa Maria up a branch of the Coco, left hand branch going up. This camp is well concealed and is not known to any but the trusted few. Indian porters are killed when they reach the camp in order to prvent the exact location being known. The information as to the location was told by and [an] Indian knowing the fate of his predecessors, escaped before reaching the camp, but he was close enough to give a pretty fair description to another who related it to me[.] This is the base of supplies, and while this information, I believe is known to the Guardia of the Northern Area, it is thought of sufficient interest to repeat. ¶ [handwritten addendum:] The above is an extract from Captain McAffee's weekly report. /s/ O. A. Inman"
Memorandum Agreement, Mr. Henry F. Springer, Bonanza Mines Company, and Col. L. L. Leech, Bluefields. "MEMORANDUM AGREEMENT. 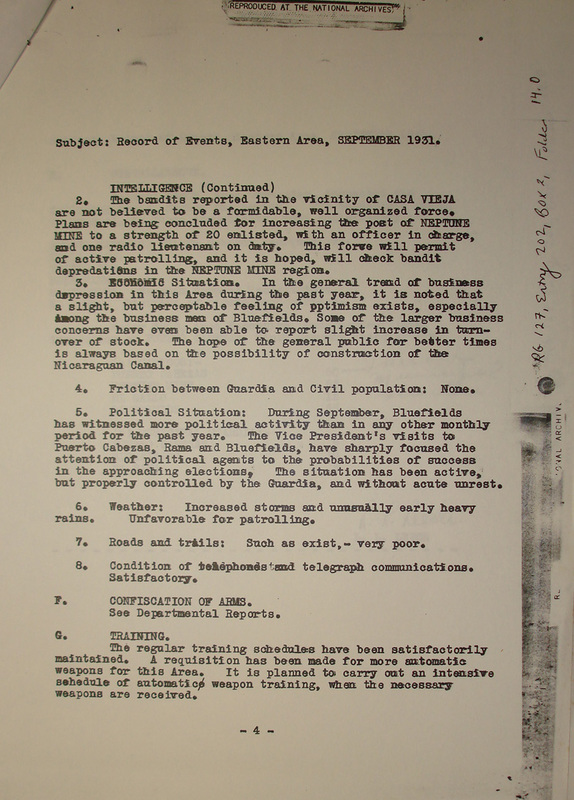 ¶ It is agreed that, in consideration of police and protection services furnished by the Guardia Nacional de Nicaragua, at Neptune Mine, that the Bonanza Mines Company will furnish transportation between Bluefields, or Puerto Cabezas, and Neptune Mine, suitable living quarters, adequate rations and the best medical services locally available, for twenty (20) enlisted men, one (1) Lieutenant, (Radio), and one (1) Lieutenant, (Line), of the Guardia Nacional. 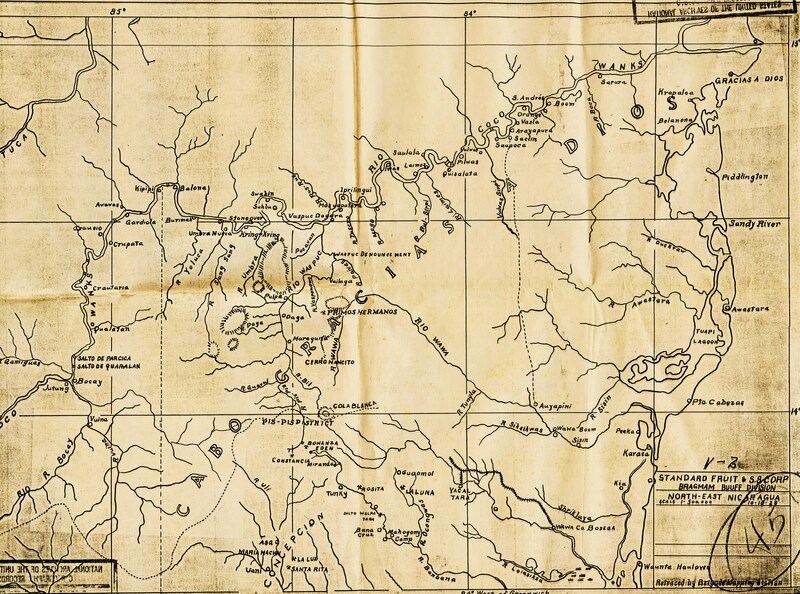 ¶ The Bonanza Mines Company also agrees to furnish transportation between Bluefields, or Puerto Cabezas, and Neptune Mine for all transfers and replacements of officers and enlisted men, all stores, clothing, munitions, and for all official inspection trips of officers, as may be necessary in the course of military routine. ¶ This agreement is effective this date and will continue in force until formally cancelled by the Guardia Nacional or The Bonanza Mines Company, on thirty (30) days advance notice. ¶ /s/ HENRY F. SPRINGER, Manager, Bonanza ¶ /s/ L. L. LEECH, Colonel, Guardia Nac'l"
Letter from C. Conrad Shrimer, Bluefields, to Rev. Paul de Schweinitz, Moravian Church, Bethlehem PA (p. 2 only). " . . . ¶ 8. See my letter to you of September 19th for explanation of the overdraft of $5,118.28. ¶ 9. I am again writing to our Manager of the Rice Mill for an accounting. He is usually working from six o’clock in the morning till twelve o’clock at night, but now I believe he has help with his books and so should be able to get out a statement. ¶ 11. As to the employment of Mrs. Bregenzer as secretary here, there are these observations: Both Brother and Sister Bregenzer were and are peculiar in their views of life. No one of the missionaries could have worked with them. They may have changed their views quite lately, but for years they firmly believed, and expressed their belief, that not one of the missionaries except they themselves were saved—because we did not believe as they did. Brother Wolff told me that in Port Limon Brother Grossmann had spoken about the Bregenzers and had said he was almost at his wits’ end as to what to do with them, for they were disturbing wherever they went because of their views. You may have heard that Mrs. Gray of Winston-Salem had sent Mrs. Remke and the two children to the mountains while Mrs. Bregenzer was North, and the children were in a hospital or sanitarium, but that Mrs. Remke took the children out because she was not satisfied with the arrangements. ¶ The housing question also comes into question should they come, as well as travelling expenses. ¶ It has been my desire to get a native young woman to serve as bookkeeper. This young lady is at present secretary in the American Consulate, but would be willing to come to the Mission. Her employment would take care of housing, travelling and vacation. ¶ I am sorry your letter did not reach me before I made up the budget, which, as you will see, calls for an expenditure of $26,668.16. We have pared very close, and as you will note, have advocated and allowed for a ten per cent reduction in all salaries. This latter will be particularly hard on those with families and the missionaries with children at home, but we felt that the step had to be taken. ¶ We have allowed for the return of all the missionaries except Brother Schramm. He is one of the oldest missionaries in service, and in recent years he has done much harm with their peculiar financial dealings and morally, too. I have felt for a long time that he should be dismissed for financial reasons, but the other members of P.B. felt that he should be allowed to continue. ¶ Brother Fisher said some time ago that he believed he could hold out this year but then would have to retire, as he is almost 70 years old. He could be asked to retire the first of the year. Brother Smith, a Jamaican, could also be asked to go home at the same time. The item under “Evangelists’ Training Schools” can be dropped and the boys sent home. Also Brother and . . .
Report & Investigation of the Death of Adolfo Cockburn, Capt. Ralph D. McAfee, Puerto Cabezas, to Col. L. L. Leech, Bluefields, p. 1. 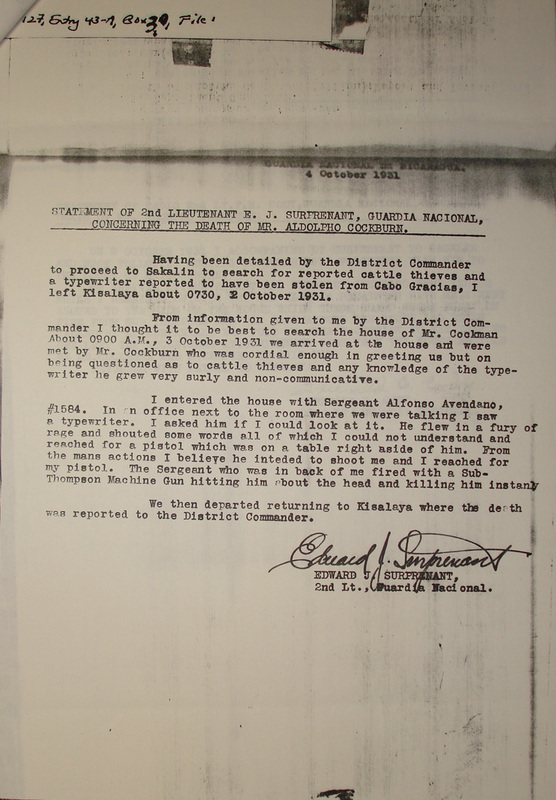 Initial report, the day after Cockburn's death at the hands of the Guardia. See also Volker Wünderich, Sandino en la Costa (Managua: Nueva Nicaragua, 1989), chap. 8, "El asesinato del diputado Adolfo Cockburn." Report & Investigation of the Death of Adolfo Cockburn, Capt. Ralph D. McAfee, Puerto Cabezas, to Col. L. L. Leech, Bluefields, p. 2. Report of Death of Adolpho [sic] Cockburn, 2nd Lt. E. J. Surprenant, 4 Oct. 1931. Report & Investigation of the Death of Adolfo Cockburn, Capt. Ralph D. McAfee, Puerto Cabezas, to Col. L. L. Leech, Bluefields, p. 3. Statement of 2nd Lt. Edward J. Surprenant, GN, Concerning the Death of Mr. Adolpho [sic] Cockburn. Report & Investigation of the Death of Adolfo Cockburn, Capt. Ralph D. McAfee, Puerto Cabezas, to Col. L. L. Leech, Bluefields, p. 4. Statement of Radio 2nd Lt. Therald E. Cody, GN, Concerning Death of Mr. Adolpho [sic] Cockburn. Report & Investigation of the Death of Adolfo Cockburn. Capt. Ralph D. McAfee, Puerto Cabezas, to Col. L. L. Leech, Bluefields, p. 5. Statement of Sgt. Alfonso Avendano L. #1584 in regard to Death of Adolpho [sic] Cockburn. Report & Investigation of the Death of Adolfo Cockburn. Capt. Ralph D. McAfee, Puerto Cabezas, to Col. L. L. Leech, Bluefields, p. 6. Second Endorsement by Capt. O. 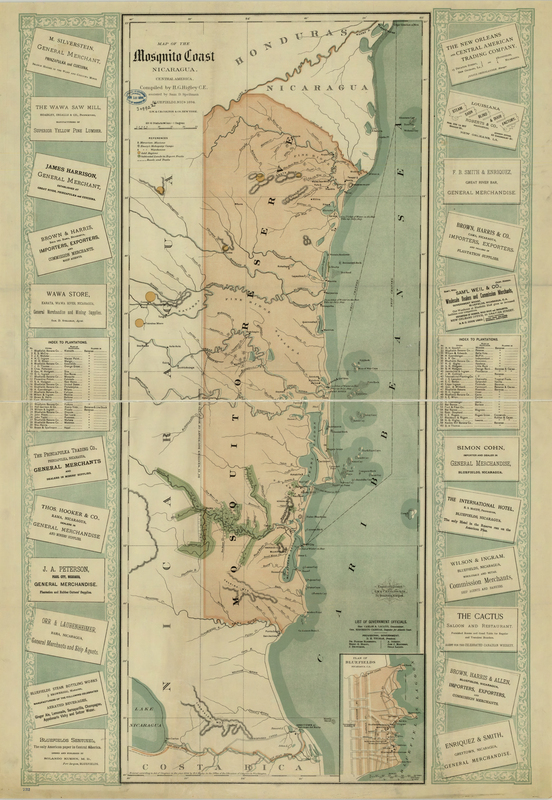 A. Inman, Puerto Cabezas, and Third Endorsement by Col. L. L. Leech, Bluefields. Letter from Col. Lloyd L. Leech, Bluefields, to Otto Salzman, Office of the Jefe Director GN, Managua. Record of Events, Eastern Area, September 1931. Col. L. L. Leech, Bluefields, to Jefe Director GN Managua, p. 1. "... Sept 25 Lieut. STONE, District Commander, at EL GALLO, reported bandits, jefe and number unknown, with 50 animals in vicinity of WAUNI and CASA VIEJA. ... ¶ 3. Contacts: None. ... ¶ POLICE OPERATIONS. ... ¶ .... 2. General Police Conditions: The Northern Department [of Bluefields] was more than normally active, during the period, in maintaining peace and good order, incident to the wholesale discharge of hundreds of negroes from the employ of the local fruit company. ... The absence of violence and unlawful assembly during this tense period is due to the activity and efficiency of these officers. The only abnormal conditions requiring action in the Southern Department, were a few attempts to organize unlicensed political meetings in the streets of Bluefields. The parties involved were required to comply with the law, and meetings wer properly controlled. ¶ E. INTELLIGENCE. ¶ 1. The general state of the territory occupied is quiet. There are two frontier points in this AREA which are potential trouble spots. Particular note is made of the fact that since KISALAYA has been garrisoned by Guardia troops during this period that there has been no reliable news, or even rumors, of bandit activity in that section. The establishment of the post of KISALAYA is believed to be a most valuable military addition to the Area, in its denial of bandit approach from the northwest. ..."
Record of Events, Eastern Area, September 1931. Col. L. L. Leech, Bluefields, to Jefe Director GN Managua, p. 2. "... INTELLIGENCE (Continued) ¶ 2. The bandits reported in the vicinity of CASA VIEJA are not believed to be a formidable, well organized force. Plans are being concluded for increasing the post of NEPTUNE MINE to a strength of 20 enlisted, with an officer in charge, and one radio lieutenant on duty. This force will permit of active patrolling, and it is hoped, will check bandit depredations in the NEPTUNE MINE region. ..."
Record of Events, Eastern Area, September 1931. Col. L. L. Leech, Bluefields, to Jefe Director GN Managua, p. 3. Recommendation for promotion of First Lieutenant Chester A. Davis to Captain, Guardia Nacional. 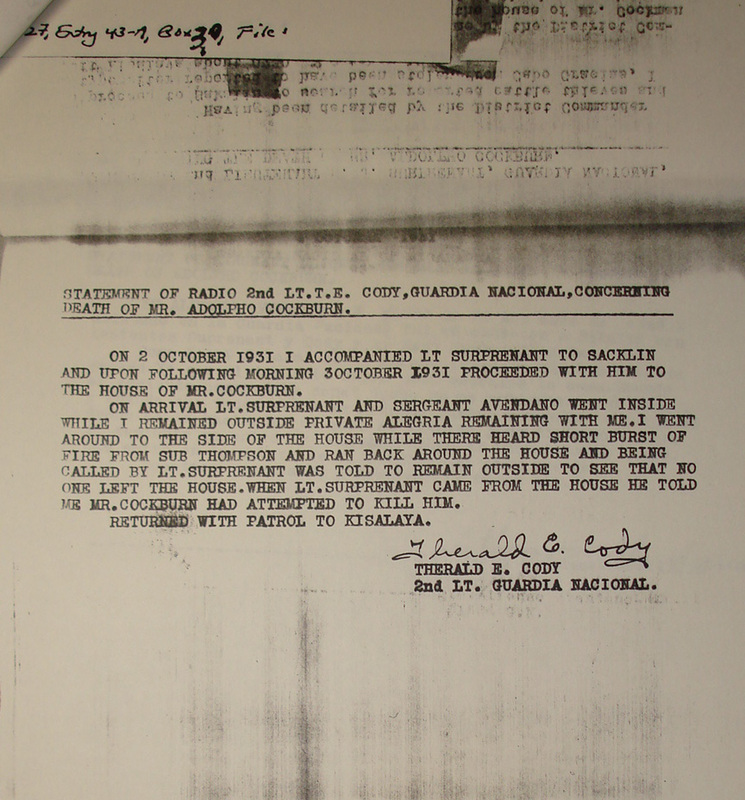 Area Commander Col. L. L. Leech, Bluefields, to the Jefe Director GN Managua, p. 1. Recommendation for promotion of First Lieutenant Chester A. Davis to Captain, Guardia Nacional. 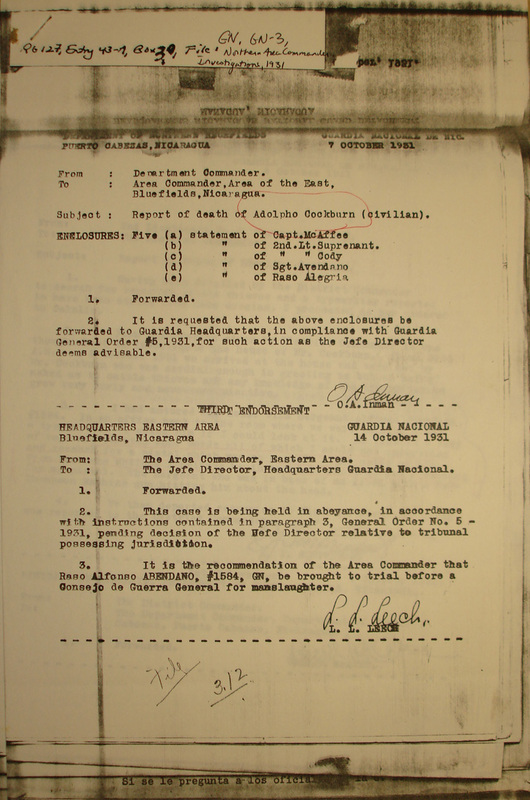 Area Commander Col. L. L. Leech, Bluefields, to the Jefe Director GN Managua, p. 2. Recommendation for promotion of First Lieutenant Chester A. Davis to Captain, Guardia Nacional. 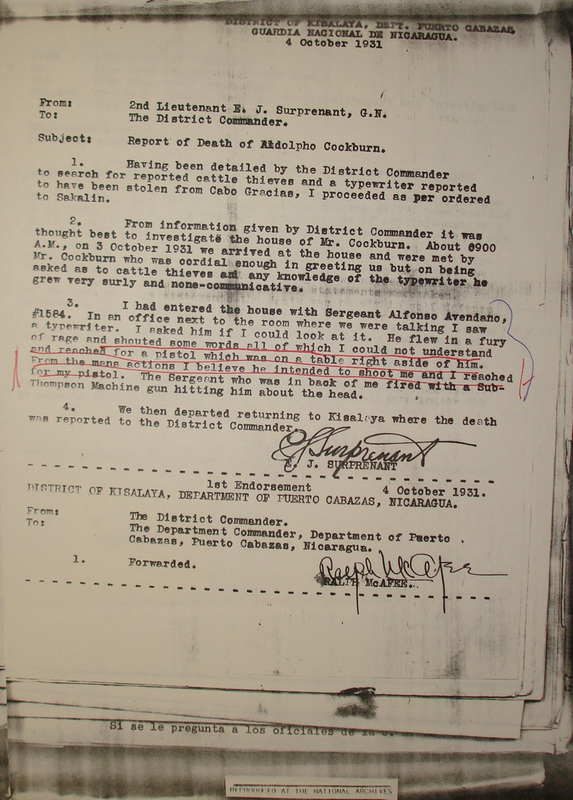 Area Commander Col. L. L. Leech, Bluefields, to the Jefe Director GN Managua, p. 3. Recommendation for promotion of First Lieutenant Chester A. Davis to Captain, Guardia Nacional. Area Commander Col. L. L. Leech, Bluefields, to the Jefe Director GN Managua, p. 4. Recommendation for promotion of First Lieutenant Chester A. Davis to Captain, Guardia Nacional. Area Commander Col. L. L. Leech, Bluefields, to the Jefe Director GN Managua, p. 5. Recommendation for promotion of First Lieutenant Chester A. Davis to Captain, Guardia Nacional. Area Commander Col. L. L. Leech, Bluefields, to the Jefe Director GN Managua, p. 6. Letter from Col. Abraham Rivera, Campamento de Operaciones Militares, Bil Tigni, to Juez de Mesta Pedro Leau, Suluu, p. 1. "Campamento de Operaciones Militares de la Columna Número 6 del EDSNN Bajo las Ordenes del Coronel Abraham Rivera Por Instrucciones de Nuestro Jefe Supremo General Cesar Augusto Sandino. Bil Tingni Octubre 10 de 1931 ¶ Señor Hermano Pedro Leau Juez de Mesta ¶ Suluu ¶ Estimado Hermano en la Patria: ¶ Hoy nos hemos juntado con la Comisión que venía por tierra Comandada por nuestro Común Hermano Coronel Chavarría quienes han llegado todos bien. ¶ También hemos tenido el gusto de recivir al Hermano Capitan Días quien viene á incorporarse á nuestra Columna número 6 quien pertenencia á la Columna Número 2 Comandada por el Hermano General Salgado. ¶ Hoy nos permitirnos rogar á Ud que cualquiera comisión nuestra que ... "
Letter from Jefe Director GN Gen. C. B. Matthews, Managua, to Ministro de Gobernación, Managua. "Rough copy" English translation. Re Adolfo Cockburn. Proposed Post at Wuani, W. G. Sheard for the Jefe Director GN, Managua, to Col. C. A. Wynn, Bluefields. "About the Death of the Hon. Deputy Mr. Adolfo Cockburn," El Independiente (newspaper), Bluefields, p. 2. Proposed Post at Wuani, Col. L. L. Leech, Bluefields, to Jefe Director GN Managua, p. 1. 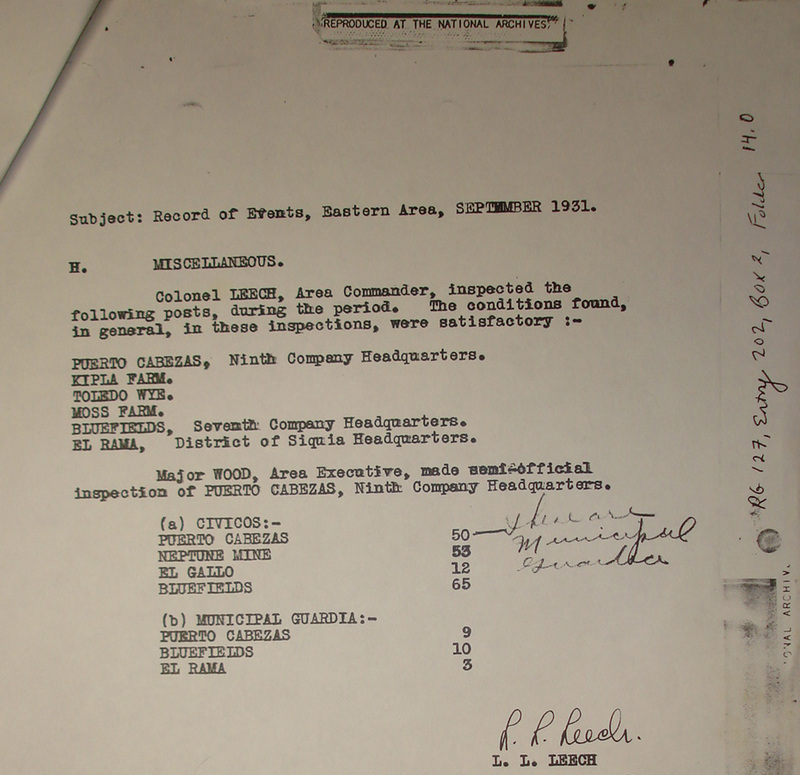 Proposed Post at Wuani, Col. L. L. Leech, Bluefields, to Jefe Director GN Managua, p. 2. Proposed Post at Wuani, Col. L. L. Leech, Bluefields, to Jefe Director GN Managua, p. 3. Radiogram from Col. L. L. Leech, Bluefields, to Jefe Director GN Managua. 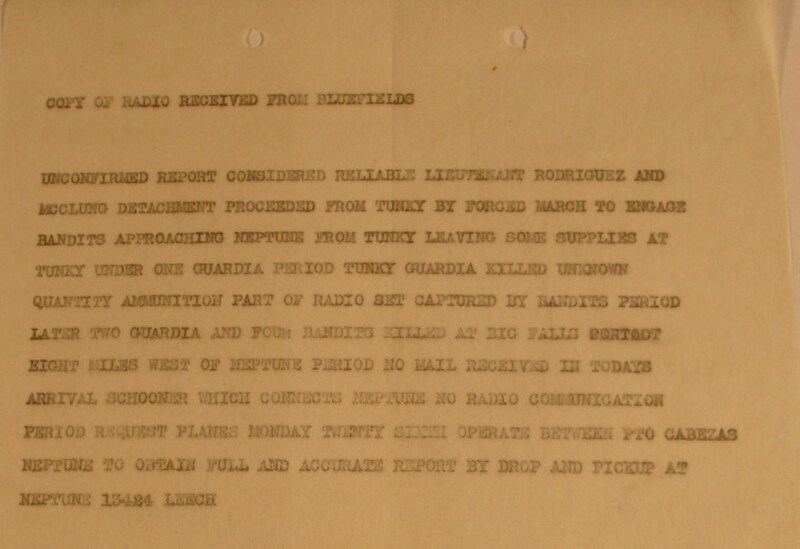 "UNCONFIRMED REPORT CONSIDERED RELIABLE LIEUTENANT RODRIGUEZ AND MCCLUNG DETACHMENT PROCEEDED FROM TUNKY BY FORCED MARCH TO ENGAGE BANDITS APPROACHING NEPTUNE FROM TUNKY LEAVING SOME SUPPLIES AT TUNKY UNDER ONE GUARDIA PERIOD TUNKEY GUARDIA KILLED UNKNOWN QUANTITY AMMUNITION PART OF RADIO SET CAPTURED BY BANDITS PERIOD LATER TWO GUARDIA AND FOUR BANDITS KILLED AT BIG FALLS EIGHT MILES WEST OF NEPTUNE PERIOD NO MAIL RECEIVED IN TODAYS ARRIVAL SCHOONER WICH CONNECTS NEPTUNE NO RADIO COMMUNICATION PERIOD REQUEST PLANES MONDAY TWENTY SIXTH OPERATE BETWEEN PTO CABEZAS NEPTUNE TO OBTAIN FULL AND ACCURATE REPORT BY DROP AND PICKUP AT NEPTUNE 13424 LEECH"
Contact Report, 2nd Lt. E. J. Surprenant, Kisalaya, to Jefe Director GN, Managua.